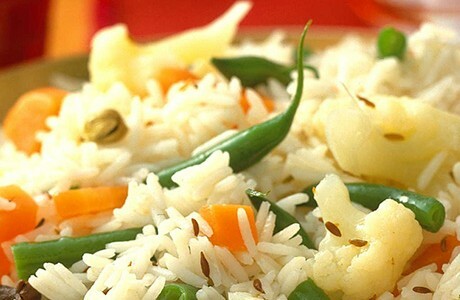 Fresh vegetables and fluffy basmati rice are cooked in the slow cooker for a delicious depth of flavour. This recipe is simple to prepare: just allow the slow cooker to do the work. This dish is suitable for vegans. Rinse the rice in cold running water then cover with cold water and leave to soak for up to 20 minutes. Heat the oil in a pan, add the cumin seeds and fry gently until they start to crackle. Add the carrot, green beans, cauliflower and Patak's Balti Paste and fry for a further 3 - 4 minutes. Drain the rice of excess water and transfer it to your slow cooker and add the hot water. Add the vegetables and mix well with the rice. Cook on high for 1½ - 2 hours.